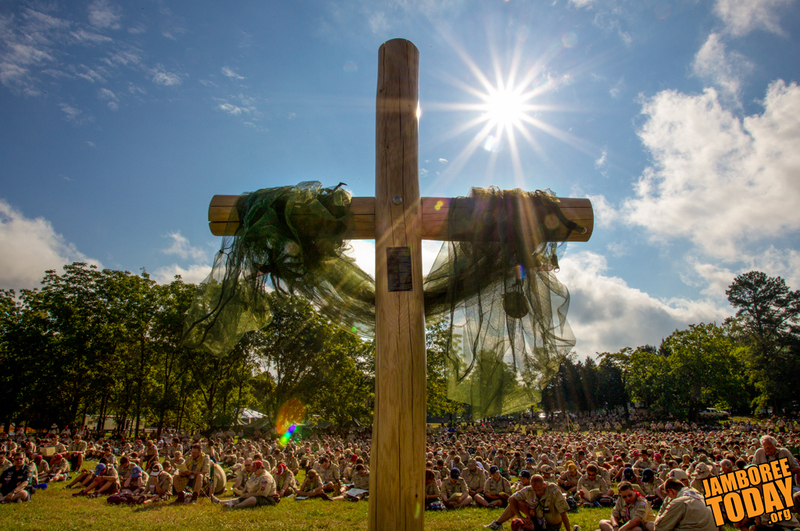 The cross, constructed of white oak from the Summit, was first used in worship at the 2010 National Scout Jamboree at Fort A.P. Hill, Va. BSA photo by Trey Spivey. After a 6,000 mile journey around the country, a special cross constructed of white oak from the Summit Bechtel Reserve will be used in Methodist and Catholic services Sunday, says Rev. Greg Godwin, a chaplain in Base Camp D.
"I never thought it would be used that way," says Godwin about the cross, which several years ago started out as a request for leftover timber from the Summit construction site. In reality, he was given a specially cut piece of white oak made into a four by seven foot cross with the help of Jack Fredeking. His company, Fredeking Stafford Construction Co., Inc., did some of the work at the Summit. Godwin brought the cross to 2010 National Scout Jamboree and after that he drove it to the Philmont Scout Ranch in New Mexico. "The two staffers at Philmont who got to brand it ... it was like Christmas for them," Godwin says. The Eagle Scout of Athens, W. Va., also brought the cross to Florida Sea Base and plans to complete his rounds to each of the Boy Scouts of America's high-adventure bases with Northern Tier in Minnesota. For Goodwin, the symbolic unity between the United Methodist Church and the Catholic Church, who will be sharing it at Sunday's services at AT&T Summit Stadium, is more important than the crosses intercontinental journey. Echoing the same sentiment, The Rev. Michael Hanifin, a Catholic clergyman of San Clemente, Calif., says, "It's a great collaboration between religious groups and Christians." Three years ago, Godwin had no idea it would come to be such an important religious symbol at the Summit. "I think it was meant to be, I really do," he says. "The understanding is that it belongs to the Summit; it's not mine," says Godwin.